Nicholas Martin started his musical career like most by studying the piano from an early age. He fell in love with the theatre organ at the age of eleven. 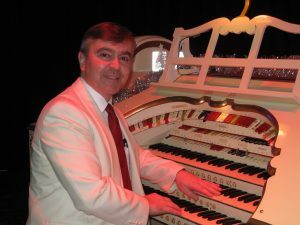 In 1975 whilst on a family visit to Blackpool he heard the organ being played at the Tower Ballroom and from that moment it became his ambition, not only to play the theatre organ, but to play at that famous venue. This ambition was realised in 1981 when he was only seventeen years old and, for the next two summers, he was a resident organist, playing the Wurlitzer made famous by his idol, the late Reginald Dixon. During his second season at Blackpool a new entertainment complex was envisaged at Northampton and this included the installation of a superb three manual, nineteen rank Wurlitzer organ. At the invitation of the owner, Nigel Turner, Nick became the resident organist and, in April 1983, ‘Turner’s Musical Merry-Go-Round’ was officially opened. Nick has produced an extensive collection of Cassettes, Records and CDs. He has appeared on TV, and made numerous recordings for B.B.C. local and national radio. He is also in great demand for concert appearances throughout the United Kingdom and overseas. In 1985 he was invited to perform a series of concerts on the four manual, one hundred rank pipe organ in the Kirk of Dunedin, Florida, U.S.A. These performances attracted, in total, audiences of over two thousand four hundred people and it is a mark of his popularity that he has returned again and again. 1994 saw his fifth bi-annual visit to entertain his American admirers. In July and August 1993 he undertook a tour of theatre organ installations in Australia and New Zealand. This too was an outstanding success, which attracted audiences in excess of three thousand people during the five-week tour. Nick, his wife Marianne and their two sons, live in Markfield, Leicestershire. Sadly, both boys have autism, which severely affects their learning and communication skills. Consequently, in 2001, Nick co-founded a charity for autistic children – ‘Miracles to Believe in’. This charity helps to support a special needs unit in Leicestershire – where Nick’s sons attend. To date, over £200,000 has been raised to help these special children. Nicholas was awarded the British Empire Medal for his charity work.